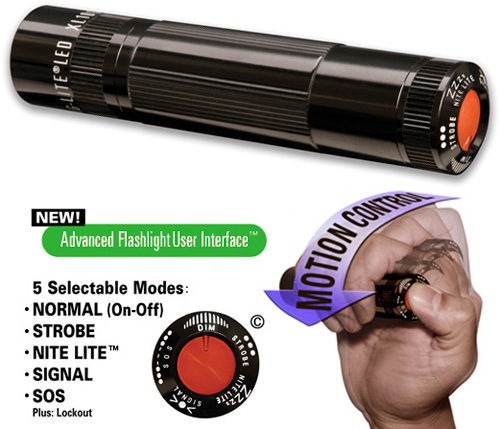 Maglite's XL100 Features Motion-Based Controls | OhGizmo! By Andrew Liszewski on 02/25/11 • Leave a comment! Maglite flashlights have always been known for their strength and durability, whether you’re out hiking in the woods at night or subduing a perp with a little force. But I can’t say I’ve ever viewed their products with any kind of gadget lust, until I stumbled across their new XL100 model. It’s a shockproof, weatherproof compact LED flashlight with 83 lumens of brightness and a multi-selectable push-button tailcap with 5 different modes including strobe, nightlight, signal and SOS functionality. But what will make the XL100 a must-have for any gadget-lovers camping trip this Summer is that it incorporates a motion sensor allowing you to adjust everything from the brightness to the strobe speed by simply holding the tailcap button and rotating the flashlight in either direction. You’ve always been able to manually adjust the beam focus of a Maglite by twisting the flashlight’s ‘cap’ but the inclusion of a motion sensor adds considerable more functionality without having to add more buttons or complexity. Available from Amazon for just $32.37, and is powered by 3xAAA batteries which are included.